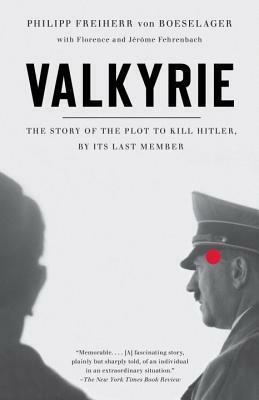 I first gained awareness of “Operation Valkyrie” when the film starring Tom Cruise, Valkyrie (2008), was first released. It makes logical sense to me that not all Germans involved in the war were Nazis, and not all Germans agreed with Hitler’s tactics. It is then the logical conclusion that some of them would attempt to assassinate the leader who had brought their country into a sweeping, global conflict. While this assassination attempt failed, I was still curious about the inner-workings of the plot and the people who would go so far as to try and kill Hitler. My expectation of this book was for it to be an in-depth analysis of the many facets of the operation. From Hitler’s security concerns to the backgrounds of the lives of the individuals involved, I was expecting this book to be a non-fictional examination of the assassination that never succeeded. Instead, I was a little surprised to read the personal account of one of the conspirators of the assassination. The whole narrative was quite short (not even four and a half hours long), and left me wanting more. While this first-person account was entertaining, it wasn’t quite enough to satiate my desire for knowledge. Because this book was only the translated account of Philipp Freiherr von Boeselager, there were plenty of details about his life and the life of his brother, but not much else. I was hoping his story would be the structure on which a deeper narrative would develop, but it remained the pure and unadulterated memoir of this single individual. I can’t fault the book for being the simple story of a German who wasn’t going to stand around and let Hitler ruin his country, but if there were a historical “wrapping” added to it, I probably would have gotten a lot more out of the book. A simple story about a failed assassination attempt, I give Valkyrie 2.5 stars out of 5.